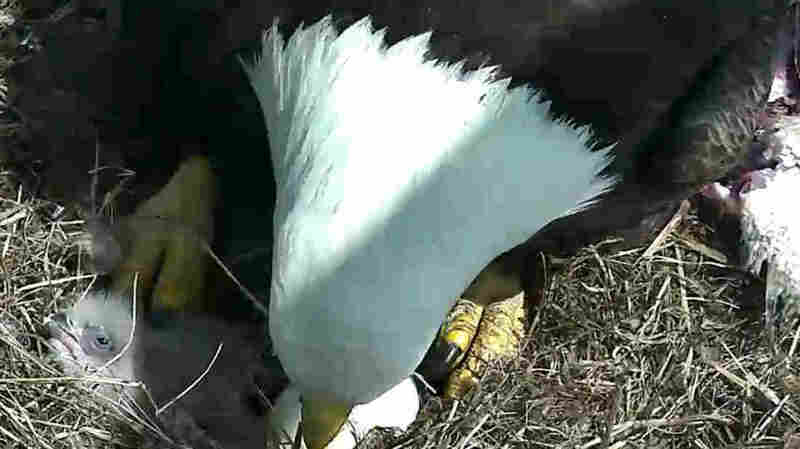 Baby Eaglet Emerges From Its Egg On D.C. Eagle Cam : The Two-Way A little wing flap came more than 24 hours after the first "pip" — a hole in eggshell — was spotted, bringing sighs of relief and joy to the baby bird's fans. Early Friday afternoon, the baby bald eagle was lifting its own head — and its parent was attempting to feed it pieces of fish (at far right). 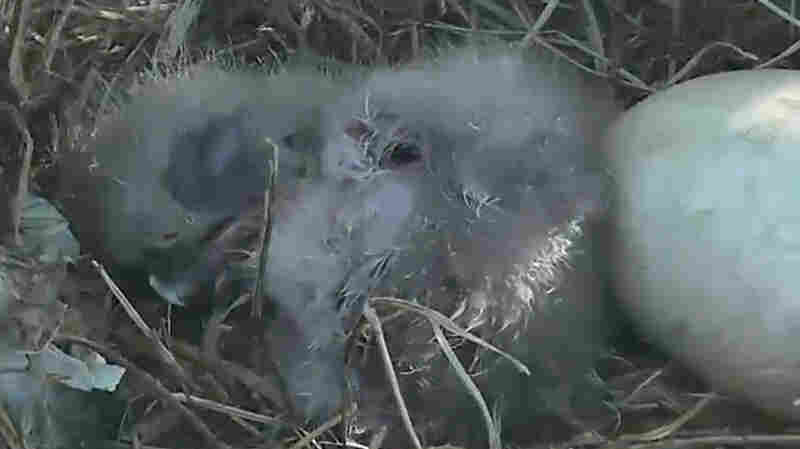 After days of anticipation, a fuzzy wing flopped out of the remains of an egg shell Friday morning, signaling the hatching of a baby bald eagle who's been watched and fretted over, via an eagle cam set up at the National Arboretum in Washington, D.C. 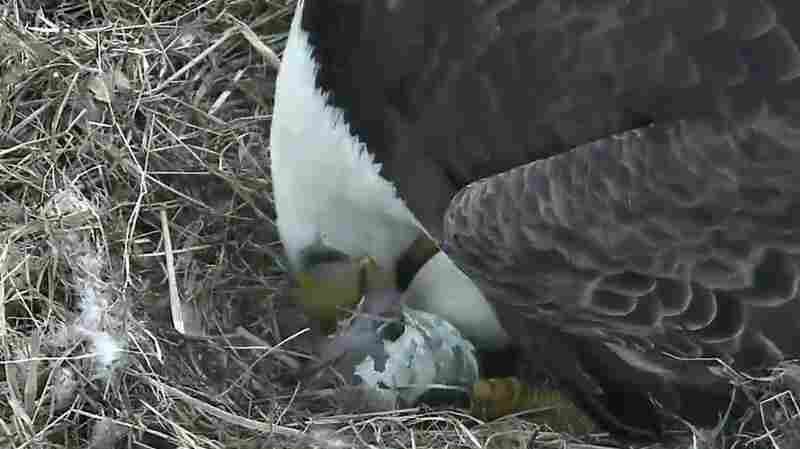 Shortly after daybreak Friday, a baby bald eagle began to emerge from its egg in earnest. After much anticipation, an eaglet began emerging from its shell Friday morning. 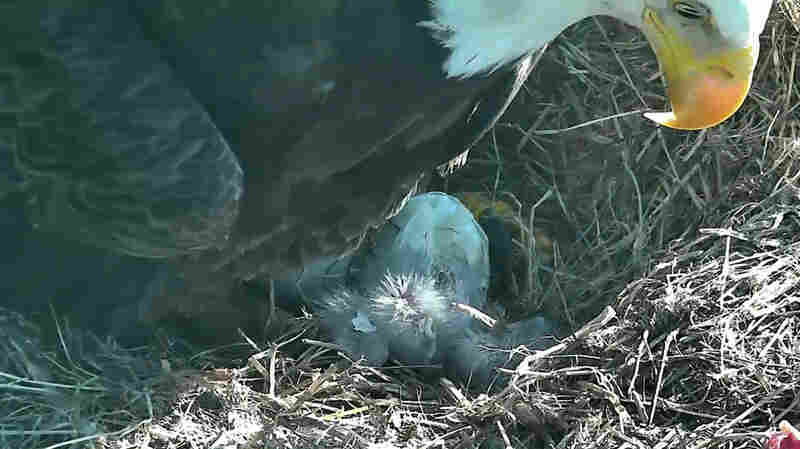 About an hour after emerging from its shell, the baby bald eagle was seen snoozing next to the second egg inside a nest at Washington D.C.'s National Arboretum. With its parent eagle looking on, a baby bald eagle emerged from its egg Friday morning. The bird then worked its way out of its shell over the next hour, emerging more fully around 8:20 a.m. ET. Throughout the process, its parent eagle alternated between peering attentively (to be honest, eagles don't seem capable of anything but) and nestling over the fledgling and a second, as-yet-unhatched, egg. The little wing-flap came more than 24 hours after the first "pip" — a hole in eggshell — was spotted, bringing sighs of relief and joy to the eagles' fans. You can watch the eagle webcam online to see the eagle's nest — but be warned, the American Eagle Foundation says: "This is a wild eagle nest and anything can happen." The egg was the first of two that were laid in February to show signs of hatching — setting off excited speculation and the Twitter hashtag #dceaglecam. The eggs have been incubated by a mated pair of bald eagles, who've taken turns sitting in the nest and hunting for food. On Thursday afternoon, a large fish was brought back to the nest for supper, a scene that was repeated at breakfast time Friday (if you're wondering, eagle breakfast is served at 8:15). "This is the first Bald Eagle pair to nest in this location since 1947," the American Eagle Foundation said, adding that the two eagles have been dubbed Mr. President and The First Lady. "If both eaglets emerge and remain healthy, they would continue a streak of success for their parents, who raised one eaglet last year at the National Arboretum, a 446-acre green space and research facility that's about two miles northeast of the Capitol building." 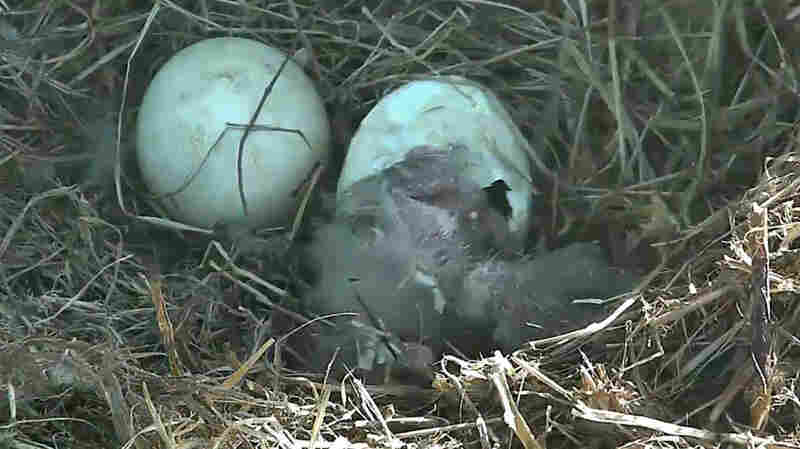 The two eggs were laid on Feb. 10 and Feb. 14, meaning it could be several days before the second egg hatches. The excitement about the hatching has also brought a chance for many people who've followed the eagle nest in Washington — and similar eagle webcams around the nation — to learn more about how bald eagles live. For instance, eagles generally mate for life, and while female eagles usually take the lead in incubating their eggs, male eagles also take a share of those duties.